At first sight, it may seem surprising to talk of external decor. However, there is nothing more unsightly than the sight of the wall behind the aquarium covered with cables and pipes! The primary role of external decor therefore consists of masking these elements, but it can also serve to highlight the plants and fish. 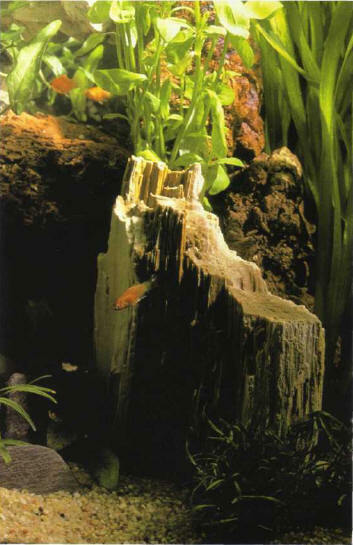 Posters with various designs, representing freshwater vegetation or seabeds, can be found in aquarium stores, but many aquarists remain unimpressed by their visual effect. They are attached to the outer face of the rear pane. The rear pane in this tank has been replaced by a mirror, to produce a striking effect. An alternative to posters is sheets in a single color, such as blue, green, gray, pale brown, or black. Black highlights fish and plants particularly effectively. A few aquarists paint a color scale themselves, pale at the top of the aquarium and darker at the bottom, to simulate the penetration of the light. Another option is to paint directly onto the back of the rear pane. Resin and sand completely insulate the decor from the water and give it a natural look. 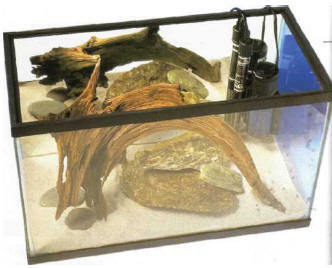 The sand used must be in keeping with the type of aquarium - freshwater or marine - and match the sediment. If you use fine sand, you will need to apply several layers. 1-3 times, depending on the sand's grain size. It is important to apply the resin carefully over all the decor, without neglecting any small reliefs, crevices, or grottoes. Only resin, without any sand, should be put on those parts of the decor that will be touching the glass panes of the aquarium. Remove any leftover sand, firstly with a large paintbrush, and then with a vacuum cleaner. The finished decor is stuck to the aquarium with silicone glue, 48 hours after drying. Follow the same process with the polyurethane set in the aquarium, and do not forget to apply resin and sand to the joins between the decor and the glass panes. Any leftover sand is removed with a vacuum cleaner. There are countless sources of inspiration if you want to create a decor but find that your imagination has failed you. but also - and above all! - nature. Photos and sketches will help you to translate your ideas into reality, particularly as to how reliefs can be harmonized. Always placed behind the rear pane, these give the impression that the tank is twice its initial size... but also that is has double the number of plants and fish! A polystyrene sheet with a coat of resin and sand can be placed against the outside of the rear pane. 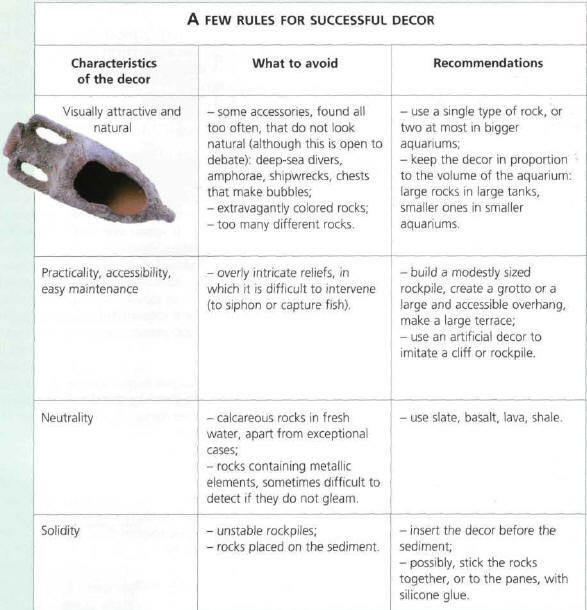 Finally, you can consider putting natural decorative material, such as rocks, branches, and roots, behind the aquarium, in front of a black cardboard backdrop. These elements can be simply wedged together, glued, or held down with adhesive clay. The overall effect is to increase the depth of field, for when an aquarium is full it seems one third smaller, because of the refraction of light in the water. This type of decor can easily be changed, needs no prior treatment and very little maintenance, the only disadvantage being that it accumulates dust. МУР (Moore) Генри (1898-1986) , английский скульптор. Работам Мура, как жизненно конкретным ("Мать и дитя", 1943-44), так и более абстрактным, иногда фантастически причудливым ("Король и королева", 1952-53), присущи пластическая мощь, ритмическая цельность, напряженность внутренней структуры произведения.